Decades of engine innovations have made today's cars, trucks and other vehicles run cleaner and quieter than ever. Increasingly stringent regulations worldwide are driving vehicle manufacturers to meet more ambitious standards while addressing customer needs for better efficiency and lower fuel costs. And as societal attitudes prioritize environmental sustainability, people demand — and deserve — fewer emissions and less noise in the areas where they live, work and play. These factors help explain the move toward electrification, most visible in Europe and within the automotive sector. Caterpillar is ready for this and has been investing in electrification for decades. the company's engineers hold numerous patents in this space, and Cat electrified products are at work on customer sites around the globe. Caterpillar is convinced that electrification is a technology that brings key benefits to its customers. For Caterpillar, electrification is "making a machine, product or system operate using electricity when it did not before." Electrification, along with high-efficiency energy conversion, is one of five key pillars in the company's technology strategy. Electrified equipment, in the right application, can benefit customers in each of Caterpillar's major industry segments through fuel savings, increased environmental sustainability, greater durability and higher productivity. Fully electric products. Featuring single or multiple non-engine electric power sources, these products are best suited for environments where eliminating emissions is key — underground, indoors, urban areas and some agricultural segments. Many of our electric rope shovels, draglines and oil and gas compression products have long been fully electric. In 2017, Caterpillar created a proof-of-concept R1300 underground loader with a battery-electric powertrain, which is now driving the development of our next generation battery-powered R1700 Mining Loader. Diesel-electric products. Connecting an engine to an electric generator, AC drive motor or other source of electric power, these products are ideal for operations where using less fuel is a priority. Caterpillar's D7E dozer, which first went to work in 2009, features a diesel-electric powertrain that delivers up to 30 percent better fuel efficiency — saving customers millions of liters of fuel over the last decade. Other examples of diesel-electric products include the 794 AC and 795F AC electric drive trucks and Electro-Motive locomotives. Hybrid products. Working alongside an engine, numerous other power sources — batteries, tethered or cable-powered electric systems, hydraulic accumulators, high-speed flywheels — can reduce emissions and improve efficiency. Caterpillar's marine hybrid propulsion system delivers full diesel-mechanical power in work mode, then switches to more efficient diesel-electric operation for less-demanding applications. The company's hybrid energy solutions provide renewable electric power to stationary locations in remote areas via a combination of generator sets, solar and energy storage building blocks. 906 compact wheel loader, a concept vehicle with a fully electric drive train powered by a lithium-ion battery. Caterpillar's dealers around the world are on the front lines of the electrification movement — adapting existing Cat products to specific regional or jobsite requirements. Several of these machines are on display at bauma as well. 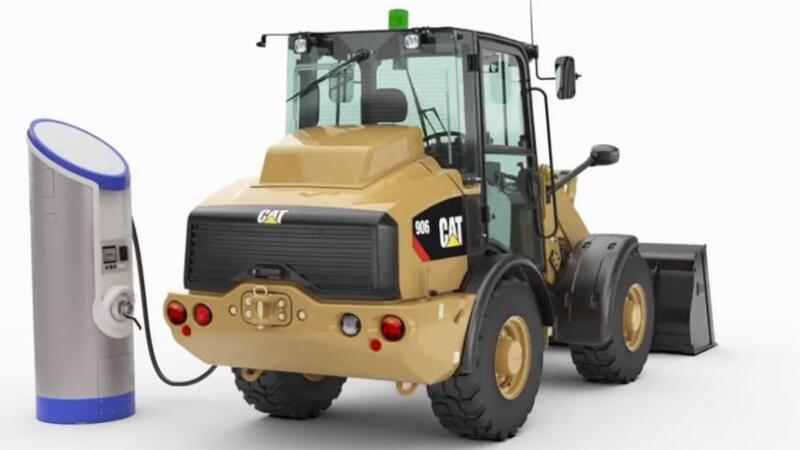 Cat dealer Zeppelin, for example, has been working with Caterpillar to develop a tethered, electrified material handler primarily for use indoors. Zeppelin has also adapted a Cat 302.7D CR mini excavator into a dual-power machine that can switch between a standard diesel engine or a cable-powered electric motor. And Pon Equipment is building eight fully electric excavators, based on our 323F model, for the Norwegian market that will run on electric motors, controllers and heavy-duty batteries. For more information, visit www.caterpillar.com.